We're devastated to share the news of the tragic passing of beloved Mountaineer Timothy Hagan. With great sadness we share the news of the passing of Timothy Hagan, a long-time member of The Mountaineers community and a prominent peak-bagger. This blog was updated in August 2018. At the time of his death, Tim was climbing Sluiskin Mountain, a 7,026-foot peak in the Crescent Lake area of Mount Rainier. He was with two other climbers who hiked out 13.5 miles to notify rangers about the fatal accident. 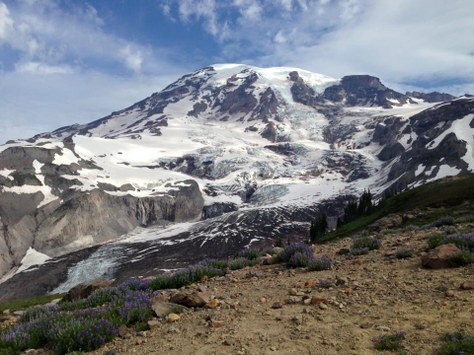 Tim was attempting to complete the 100 Peaks at Mount Rainier National Park and Sluiskin was the 99th peak on his list. Tim joined The Mountaineers in 1978 and is a graduate of our Basic Climbing Course. His passion has always been reaching the top of Washington's highest peaks, and he has achieved the reputable honor of receiving The Mountaineers Six Majors peak pin - which is given to members who have climbed the six major Cascade volcanoes, including Mt. St. Helens before she erupted. Active on PeakBagger.com, Tim was actively recording all of his ascents and most recently visited Jolly Mountain. Tim traveled locally and internationally to climb. An accomplished mountaineer, Tim summited peaks over 20,000ft, most notably Volcán Chimborazo in Ecuador. Other notable climbs include summits in Mexico, Nepal, Bolivia, and Morocco. The Mountaineers Olympia Branch director and leader Henry Romer ran into Tim on a trip this summer at Meany Crest. As a fellow Mountaineer in pursuit of the 100 Peaks at MRNP, Romer shared, "He had just finished number 97 and I was about to get number 72. We talked about our engagement with the list. He had turned 60 and I was 70 when Gene (Yore) interested us in bagging these peaks. Tim lived doing what he loved." For more information about this accident, please see the accident report published by the American Alpine Club and the article in the Tacoma News Tribune.